Brooklyn & Boyle - Life, Arts community & Culture in LA's Greater East Side. Boyle Heights, City Terrace, El Sereno, Cypress Park, Highland Park, Downtown, South Pasadena & more in a print and online media publication. Bonn, Germany—I am fortunate to be attending the 23rd Conference of the Parties to the United Nations Framework Convention on Climate Change (UNFCC), or “COP23,” here. Since my arrival to this historic old-world, yet still very modern European city, I’ve learned a great deal. I have had the opportunity to reflect on those learnings and have come away feeling positive and hopeful about our earth’s future. That hope I’m carrying within me now has been sparked by those I’ve encountered at the conference, among them people from all corners of the globe as well as several hailing from various municipalities across our own great state of California. The COP23 is the United Nations committee of 197 nations assembled to address the effects of global Climate Change. Its first agreements—negotiated in a multi-national effort to confront the reality of global warming—were signed in Kyoto, Japan at a similar gathering convened in 1997. Although the United States was not a signatory to those agreements, many other nations have continued to advance strategies to reduce greenhouse emissions via mitigation and adaptation throughout the world since then. In 2015, led by President Barak Obama, the United States signed off on the COP21 Paris Accords. Finally, climate change leapt to the top of bilateral global priorities because the various nations of the world seemed unified and committed to identifying sensitive climate targets, reporting on their progress and holding one another accountable through a rigorous, standardized process of review. Progress continued to be made until newly elected President Donald Trump abruptly announced that the United States would rescind its status as a signatory to the Paris Accords. The U.S. withdrawal left a leadership vacuum that has been the topic of much widespread interest in Bonn. Many delegates to the Bonn meeting wonder what far-reaching impact the unexpected departure of the United States from the group of countries that had endorsed the Kyoto Protocols will have on the resolve of those remaining to tackle and arrest the pace of climate change. Many were relieved when California Governor Jerry Brown, leader of the United States’ largest state and the world’s sixth largest economy, asserted himself as a sub-national actor to assure delegates in Bonn that the United States still supports the spirit of the Kyoto accords. Everywhere we bear witness to the trending nature of the #werestillin hashtag on social media in support of a U.S. presence and role among the assembly of 197 nations. While not expressed as a matter of national policy like it had been during the Obama administration, the initiative is meant to be predicated on the collective actions of the most populous and prominent states in the U.S. Governor Brown’s participation and resolve make me proud to be a Californian and a former gubernatorial aide during his tenure as the state’s highest elected officer in 1978 and then once again in 1991. 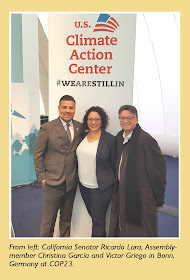 I attend proceedings, panels and discussion groups as a board member of Climate Resolve and as the founder and representative of Water Education for Latino Leaders (WELL), a non-profit organizations committed to educating local Latino elected officials on 21st Century water management strategies. Water Education for Latino Leaders (WELL) founder Victor Griego. I am here to identify and enlist partners for a global water discussion at the California Climate Change Summit to be convened and led by California Governor Jerry Brown in September of 2018 in San Francisco. The idea is to connect WELL to water practitioners from Latin America, who will also be at the September 2018 Bay Area conference, with the intention of identifying and learning best practices for water management and to explore “twin city” water strategies. I learn of the twin city concept from a panel of German scholars and practitioners who describe how two cities can, through healthy and friendly competition, learn from each other with respect to sustainable water management practices that are in alignment with climate accord mandates. This is especially important because water concerns are challenging cities across the hemisphere, even as extreme climate events become more prevalent. California city officials will need to be better prepared to serve their constituencies and stakeholders during these inevitable crisis events. If local city officials can learn from their counterparts in other countries, we can certainly work with our neighbors in California to coordinate efforts and share resources to create a sustainable quality of life for our families and communities. The best preparation is education and cooperation. There are not, it seems to me, enough working-class and people of color present in the Bonn proceedings. But the fact remains that the weight and toll of climate change falls on all people equally, and therefore everyone must be heard if mandates from climate change accords are to be successfully implemented. I realize that we are going to have to be intentional about building awareness and activating working people and people of color to identify and help develop their needs, as well as the strategies for fulfilling those imperatives. We must also make genuine efforts to bring them to conferences such as these where their concerns and issues mustn’t be ignored or dismissed. We already know that we need to think globally and act locally. 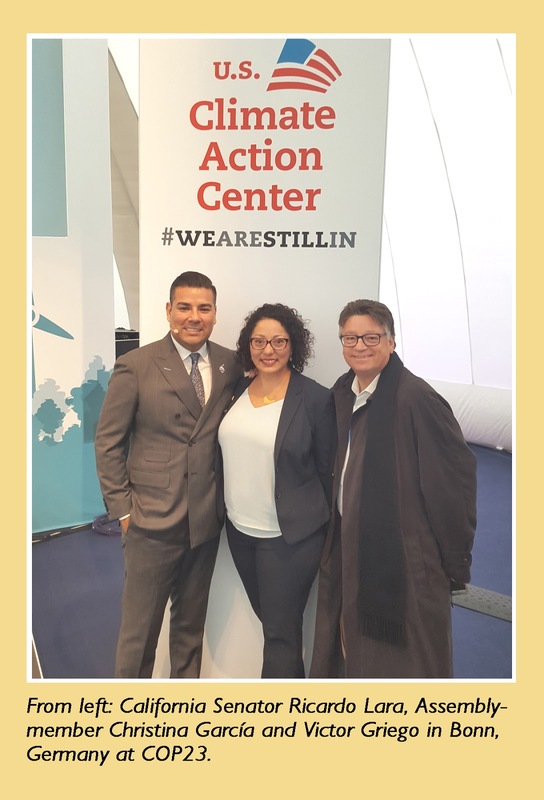 It is very empowering and uplifting to see California Latino legislators Senator Ricardo Lara and Assemblywoman Christina García presenting summaries on California’s work to address climate change as participants in this critical global dialogue. They represent a new generation of local leaders intent on getting things done in order to make our communities healthier, safer, and more sustainable. Learning of successful strategies in other cities can help us here in California. WELL’s mission is to educate local elected officials to make our communities more sustainable. 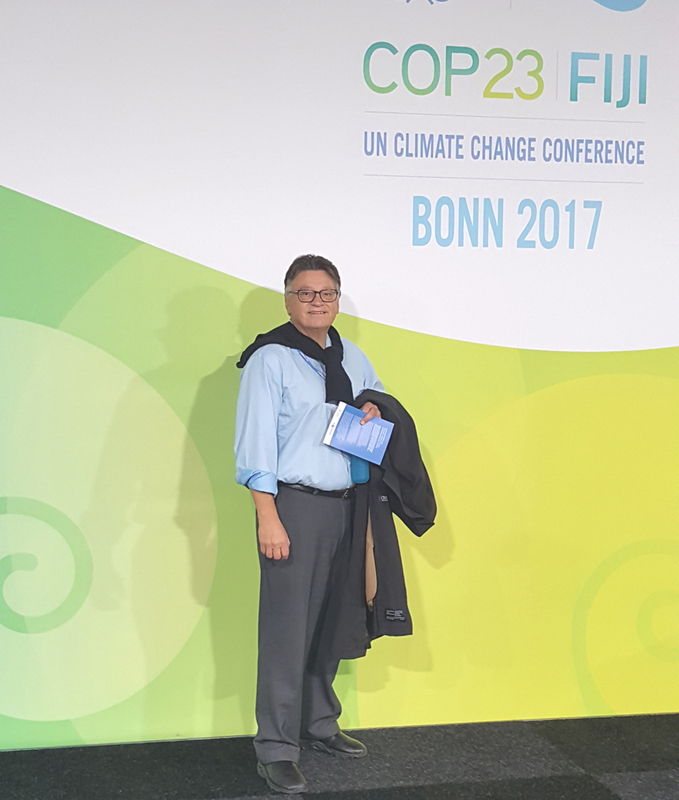 Representing WELL at COP23 is another step towards that goal.